Ahead of the royal wedding in May, the Conservative leader of Royal Borough of Windsor and Maidenhead council, urged Thames Valley police to use their powers to clear the area around Windsor Castle of its expanding population of homeless people. "A large number of adults that are begging in Windsor are not in fact homeless, and if they are homeless they are choosing to reject all support services … In the case of homelessness amongst this group, it is therefore a voluntary choice." Dudley's comments were criticised by charities working with the homeless, and by the prime minister, Theresa May, who is MP for Maidenhead. So how valid is the claim that some homeless people prefer a life on the streets, sleeping rough and begging, to some form of sheltered alternative? The expanding numbers of homeless people is well-known. 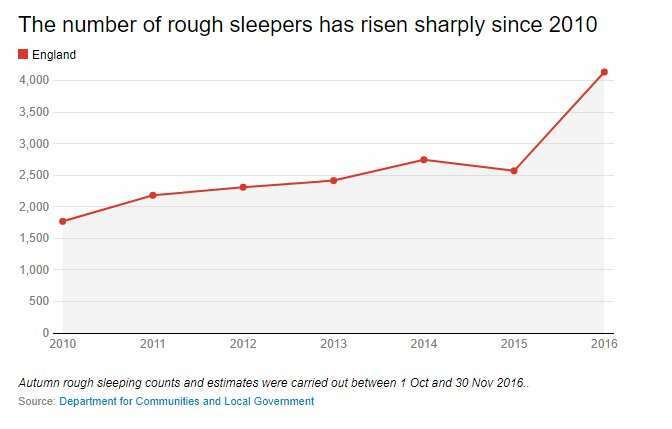 The government's official measure of rough sleeping, based on an annual single night headcount, increased from 1,768 in 2010 to 4,134 in 2016. The growth is widespread and not limited to traditional urban hotspots, although the figure for Windsor and Maidenhead remained fairly static – at eight in autumn 2016, up from six the year before. Two issues are central to the debate about whether people choose to be homeless: the triggers that bring people on to the streets in the first place, and the duration of homelessness episodes. Both are changing in ways that reduce the amount of choice that homeless people have over their situations. According to the most recent figures on statutory homelessness prevention and relief, the most rapidly expanding reason for homelessness for all households since 2010 is the ending of assured shorthold tenancies – the main tenancy agreements between a tenant and a private landlord. These last for between six and 12 months and can be ended by either party. Tenancies end for a variety of reasons and homelessness need not be the immediate outcome. However, in the context of rising rents and the increasingly limited scope of housing benefit to cover the costs due to caps imposed by government austerity measures in recent years, tenants are frequently left with few options when a tenancy ends. There is also further evidence from London that the expanding homeless population masks a more rapid increase in persistent homelessness. The Mayor of London's report from the Combined Homelessness and Information Network database for 2015-16 showed that while the total number of people seen sleeping rough by street outreach teams in the capital increased by 7%, the proportion who had also been seen the previous year increased by 15%. The proportion who were seen in more than one quarter of 2015-16 was 25% higher than the equivalent figure for 2014-15. In other words, people are staying on the streets for longer and are more likely to return to homelessness after brief periods of precarious temporary accommodation. Once again, the primary factor is the diminishing range of affordable options, including hostel and rented accommodation as government funding for supporting single homeless people has declined. Some barriers are especially significant, such as a lack of preparation for discharge from prison or hospital, which can leave people reliant on informal sources of shelter. It's at this point that the issue of choice becomes especially acute, yet is frequently misunderstood. It's often assumed that people who refuse offers of help must prefer to remain homeless. But choices are affected by the range of options on offer. A woman may prefer the relative safety of a partner on the streets to the risk of intimidation in a hostel, and very few emergency hostels will accommodate couples. And there is evidence of the increasingly complex needs of the homeless population, especially greater levels of mental distress. People with mental health problems will decline offers of hostel places due to bad past experiences of exploitation and intimidation. For political figures to promote the view that homeless people choose to be homeless is immensely damaging to homeless people and to those who work tirelessly to offer them humane choices. 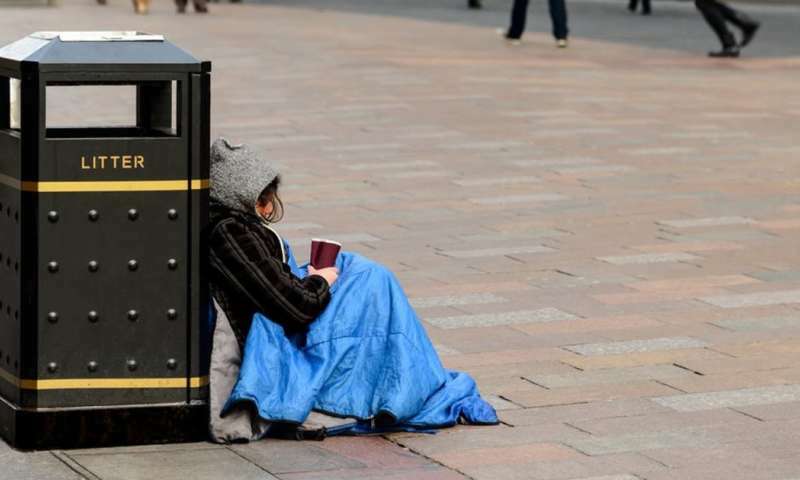 Many homeless people are made homeless by loss of accommodation and the inaccessibility of alternatives, but many others become or remain homeless because those alternatives pose a far greater threat to their well-being than a park bench or a shop doorway. Any blanket statement about a diverse population will probably be wrong and can be quite misguided. Saying that they ALL are there by choice or that NONE are there by choice are both likely to be wrong. Only a scientifically conducted empirical evaluation can quantify the drivers of the observed behaviour and living conditions of that population.